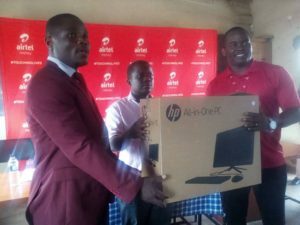 MCHINJI-(MaraviPost)- As part of its corporate social responsibility ‘Touching Lives’ program, leading telecoms network provider Airtel, through funds from the Airtel Money Trust on Wednesday 10 brand new state of the art HP desktop computers to Kapondo Community Technical College (CTC) in the boarder district of Mchinji. The donated computers are with a 4g MiFi router that is pre-loaded with a 100gb data bundle start up. 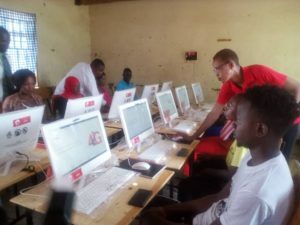 Established in 2015, Kapondo CTC is the third out of the total 11 technical colleges that Airtel Money Trust will be supporting with brand new computers. Airtel Malawi Senior Zonal Business Manager Misheck Kavuta the donated computers aimed at supporting the ITC component at the college. Kavuta therefore advised the college’s authorities and students to look after the times for its proper usage. Kapondo CTC Principal Andrew Nongwe lauded Airtel for the timely support saying will improve on auto-card lessons through internet surfing.